I’ll start but saying Happy New year to everyone in Sawville and hope Santa treated you well for Christmas. The winter months in the world of tools slow down but I’ve been lucky enough to have a few saws streaming through the shop for sharpening and restoration so my hands haven’t been too idle. December and January are always slow on the auctions and boot sales so I was happy to get a call from someone I met earlier this year at the Hearne Hardwoods open house. He had a number of older saws that he was selling off and at the time we met he was just looking to get rid of any that had been left by the previous pickers who had gone through the collection. His small shop was located not far from Trenton. I knew the seller that had gone through the collection so at best I figured I’d find some interesting wall hangers and saws for parts. After a quick tour of his shop we headed over to his storage area and dug through one of the largest collection of carpentry day or travel type boxes I’ve seen. Rick explained that for years he’d hit the Golden Nugget flea market and bought them when the prices were just a few dollars. He’d sell off the tools but liked the boxes. Over time, like most stuff with drawers, they filled up. 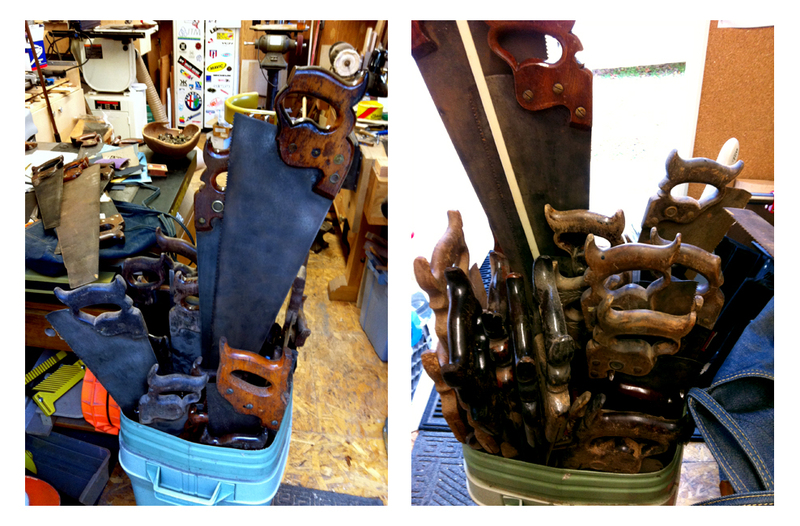 Saws for so many years had low value, and well, they just piled up. Now that pile was on a tarp in my wagon and as promised I took all of them, the good and the bad. Once back home I sorted them into trash, parts and possible restoration/keepers. As I had figured, most were in the trash and parts piles but Rick had some really nice wall hangers for the few of us that enjoy the history and look regardless of the function. Rick was a retired carpenter but also did some turning on the side and in the mix was a bowel of various saw screws and hardware that was fun to go through. I’m always in search of spare Munger patent screws as many of the early Peace and WMC saws used them, and due to the design they don’t take excessive torque well. After the dust settled I set to work pulling handles from plates. Note to self, I need to find a local scrap yard as my collection of bent plates must be near 100 pounds at this point. As predicted, I did find a few interesting wall hangers for the shop and I’ll share a few of them. The first is an unmarked, I would guess English, table saw that looks to have last been filed rip. At first I was thinking this was possibly the remains of a panel saw that’d just seen a few decades of use, and at some point the lower cheek started to get in the way so the handle was cut to be open. However, as I now write this and look at the pictures, I still feel the plate has been cut down but the handle was mostly likely always open. The old English beech handle with split nuts remains tight and I would guess at some point as the saw grew shorter a nib was added, then broken off. The beak and top hook of the handle have that classic FAT yet shapely look like a plump woman in a Renaissance painting. Next up is a well loved early Disston. I’m guessing this is a No 9 but I thought they used apple handles. This one however looks to be beech or at least not a fruit wood, but it’s been heavily coated with finish so it’s a little hard to tell. Regardless, it’s a wonderful old Disston from a time before aid of machinery. This sucker was hand shaped with files. The No 9’s are also an interesting model in that the handles changed shapes and some examples look more like the No 7, while others have the double lobes of the later No 12. I’m not sure if the plate is original to the handle but a faint etch can be made out. I also found a small secondary one closer to the handle of which “Warranted” is about all I can make out. I’m a sucker for hardware saws so this was a keeper regardless of the condition. 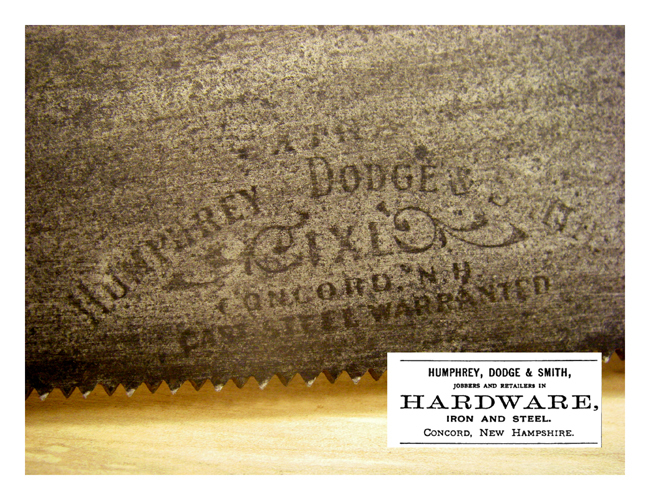 It’s amazing the info one can find online and a quick Google book search found me this ad from the 1880’s, Humphrey, Dodge & Smith Jobbers and retailers in hardware. Look at the saw screws that are a distinctive dome style that with repeated use have sunken into the apple wood handle. It’s interesting to note that most saws filed this deep into the plate would exhibit a shaved cheek from the handle hitting the wood with each stroke or a broken lower ogee. This one seems to have had some care taken by its previous owners. I’ll finish with this one and as someone who’s done their fair share of repairs I love the use of recycled bits, fit, and finish. I find a good deal of Spears & Jackson saws in my travels. For the most part I think the early ones had inferior steel to the US counterparts but handles, fit, and finish are always quite nice. The wood alone in this handle is nicer than most I find in similar years made in the US. However, what kept this one from going under the knife and off to the scrap yard was the repair. The saws may be from the UK but that handle repair is all America. I’m left wondering what the 5 stapled in the metal represents. Also note the fit of the screw heads; this was done with care by someone who felt if they were going to take the time, regardless of the job, it would be done right. Surely worthy of a place on the wall. I’ll pick out a few others for a later date. . .
Wishing everyone a happy and healthy 2014.